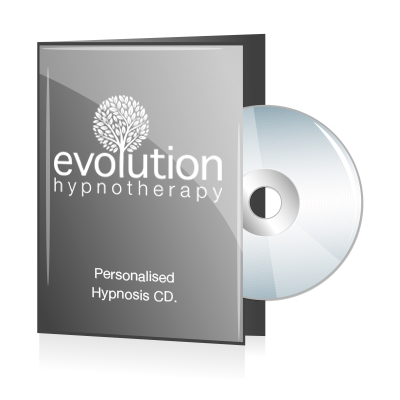 Customised Hypnotherapy CD’s and Mp3’s from Evolution Hypnotherapy! Unfortunately, due to my very busy private practice, the waiting list for CD’s has become too long so I am temporarily ceasing creating bespoke recordings. If you don’t have the time or the money to follow through a hypnotherapy programme, then this service could be just right for you! Do you need a little help in overcoming a problem? Some people put off seeing a therapist because of the unknown aspect to it, they just don’t know what to expect. Of course, normally a quick 10 minute chat over the phone will relieve a lot of worry and concern. Some people just don’t have the time to see a therapist, either because of work commitments or just because of their busy lifestyle. For those people and others who would like to try hypnosis, listening to a recording in the comfort of your own home, or any other safe environment, may really appeal! What is the difference between my recordings and general recordings? The listener may have trouble remembering a time when they felt confident etc. Can you see the difference? To Tony, this would bring back amazing feelings of pride and confidence and because it is his memory, the feelings in hypnosis would be really magnified, then we can lock in the feelings. Just ask me about your problem and I will instantly let you know whether it is advisable to order a personalised hypnosis recording. There are certain conditions that I wouldn’t advise trying to treat using a recording, such as, trauma, Bipolar disorder and personality disorders. I also feel that phobias should be tackled in the therapy room. Anything where there may be intense fear present should be handled by a trained therapist, face to face. How much is a personalised Hypnotherapy CD? It can take me over an hour to record, edit and mix a recording. I use the latest audio editing software and have a professional set up including a broadcast quality microphone, so my voice is clear and rich. The CD is sent via Royal Mail, 1st class. If you also require an MP3 then that is no problem. I simply include this on another CD at no extra cost! How do I order a personalised hypnosis CD? 1. Simply drop me an email at info@evolution-hypnotherapy.com and tell me a little about what you want to deal with. 2. I will reply and ask you some important questions about what you want to deal with. (This is all strictly confidential). 3. I personalise the CD by asking some questions about the direction you want to go, what you wish to change etc and will formulate a strategy. 4. I ask for payment. I can accept card payments over the phone and Paypal. 5. I record the session and send it on to the address you specify. You should receive your personalised hypnotherapy recording between 1 and 4 weeks. This can alter depending on the volume of work I have. I will, however, aways keep you up to date with the progress of the recording. *Delivery is based on areas within the UK. If you live outside the UK I will advise you on any additional cost.